I confess that Emerson, Lake & Palmer have never been among my biggest prog favourites. The trio's highly virtuotic music often tends to be "too much", over the top. 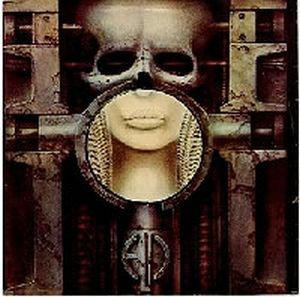 I do enjoy a great deal of their [70's] output, but the album I find the most painful to listen to completely is Brain Salad Surgery. Yes, the one they promoted with this single. H. R. Giger's unique artwork for the album cover is circulated here. You know how it was with ELP: the ballads of Greg Lake always tended to be chosen for a single's A side. His new song 'Still... You Turn Me On' (also on Brain Salad Surgery) had already impressed live audience before the album was released. But this time they wanted something more representative for the whole trio. There really could have been no better choice than the powerful and majestic version of the well-known church anthem 'Jerusalem', which Sir Hubert Parry composed in 1916 to the poem by William Blake. The composition is of course gorgeous in itself, and it's no wonder that the audiences in the BBC Proms Festivals sing it from the bottom of their heart (I would, too!). But ELP made a deeply impressive version that summarizes the essence of the band. Keith Emerson's mighty organ playing, impassioned vocals of Greg Lake, and the "drum for your life" approach of Carl Palmer work together extremely effectively in this song. Sometimes the hair of my skin may stand up for disgust when I listen to ELP, but when I listen to 'Jerusalem', it stands up for bliss. The B side contains an instrumental with a long and pretentious name: 'When the Apple Blossoms Bloom in the Windmills of Your Mind I'll Be Your Valentine'. The music is interesting however. It has a strong sense of Jazz Rock / Fusion, and even though it's very keyboard oriented, it has a nice groove and it feels more democratic as a group effort than many of Emerson's compositions. The track was re-released in Works 2 (1977). Much to my own surprise, I rate this single with five stars, like the majority have done here. 'Jerusalem' is an undisputed masterpiece of prog songs covering someone else's music, while 'Apple Blossoms' is another kind of musical delight.